Tips on Planting "Climbing Roses" on a Rose Trellis | My Garden Trellis - Make Your Garden Beautiful! Climbing roses are some of the most in-demand plants in the garden because of its unrivaled beauty, bright colors, and distinct growth. Even though it’s called climbing roses, garden professionals make it clear that they’re not really real climbing plants, like vines. This is because they do not have appendages that can help in affixing themselves onto structures. So how do they climb? They need some kind of a support, like a vertical structure, to assist them in their upward growth. To start with, pick a rose color that would compliment with the colors of the different flowers in your garden. Certain hues look best when placed side by side with the others. After you have selected your rose color, the fun and difficult part begins. A normal climbing rose usually generates two kinds of shoots. The main one is a long strong shoot where the smaller one would appear. Proper care should be provided on the major shoot because it will carry the weight of the entire plant as it grows. For this reason it’s imperative that you already have determined where you want your roses to be planted from the beginning. Timely preparation is a must. 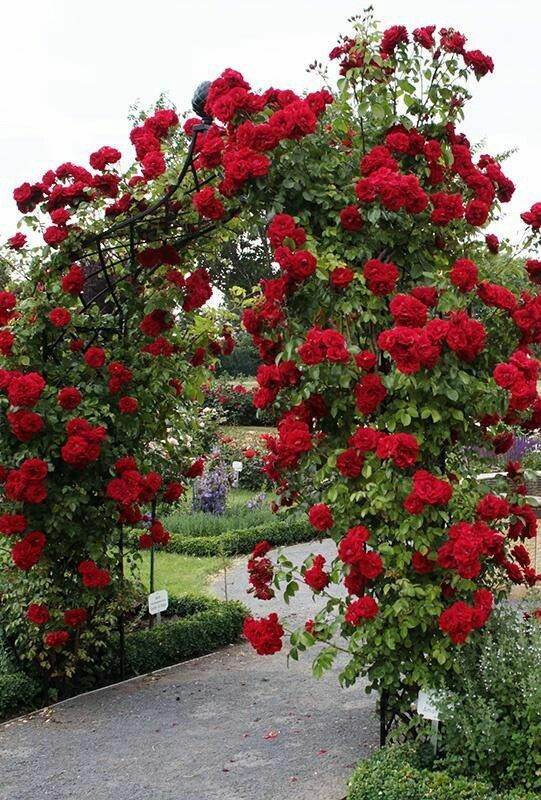 Because climbing roses generate more flowers if the major shoot grows vertically, you need to make sure it is attached to a sturdy structure for stableness, like a fence. No fence at home? 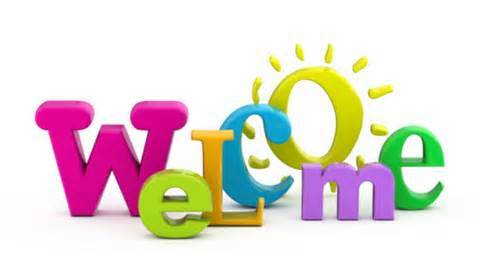 You can purchase, or devise and build your own trellis where your roses can easily climb onto. 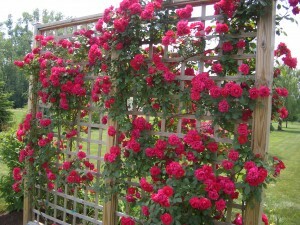 In purchasing a trellis, do not forget that climbing roses might grow abundantly in the future. It will also be open to harsh elements in the environment, such as extreme weather conditions. As a result, your trellis should be strong to bear the weight of the rose plant. Construct the trellis by burying it firmly into the ground as well as on a strong foundation. The encircling area where it is being installed should also have excellent air current and ought to be away from any barrier. To plant the roses appropriately, dig a hole twice the diameter of its entire root base and depth around two feet. The midpoint of the hole ought to be about 18 to 30 inch away from the foundation of the fence or trellis. Remember to softly cover the roots with soil. In locations with warmer climate, the root base or graft union must be placed a little above the soil elevation when planting. In cooler areas, the root base needs to be two to six inches underneath the soil elevation. After that, water your rose plant and put some fertilizer on the ground. Put enough mulch without burying the trunk. Lastly, attach the plant stems on the trellis or fence utilizing flexible plant ropes. If possible, tie the stems up in a horizontal position. Make sure the trellis or fence is balanced well by leaving some gaps and getting rid of broken stems. In gardening, patience is a required before you can reap the rewards from your hard work. Climbing roses might take a while to produce flowers. Do not forget that this type of rose differs in height based on the climate in your area. Your dependable gardening shop should know the type of growth you should anticipate when you buy your plant. With this project, you can showcase your creativity. 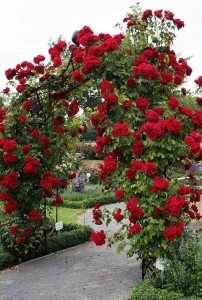 Apart from your fence and trellis, you can also train your roses to climb over pillars, arch pathways and garden sheds. You will be amazed at the beauty that your climbing roses can give to your garden as they grow! Excellent tips on planting climbing roses. Sure, these tips are useful for the gardeners, especially newbies. Thanks a lot for sharing your knowledge. Thank you for the tips. I m now growing my own roses from cutting, n been very sucessful in Bermuda my home island home.